Lansdowne is an unincorporated residential planned, resort-style community, located near Leesburg, Virginia, north of Route 7 and south of the Potomac River, approximately 25 miles west of Washington, D.C. A master association, the Conservancy, umbrellas the major properties held in common, and oversees separate homeowners associations (“HOA’s”) for each project, all run separately. Under the Conservancy, there are 3 major HOA’s: Lansdowne on the Potomac, Village Greens, and Leisure World. Additionally, there are smaller HOA’s for the lands held in common that include office and retail space, as well as other services, creating a complete town center under the area called Lansdowne. With the additional presence of the luxurious Lansdowne Resort, residents enjoy a country club style of living with the convenience of shopping and services, making it a prized location in Loudoun County. Lansdowne is home to Lansdowne Resort. The Resort is a Washington, DC area full-service luxury escape. A recipient of the AAA Four-Diamond Award in every year of its existence, the resort combines impeccable service, urban style, understated luxury and premium amenities. Lansdowne Resort is home to The Golf Club at Lansdowne – the centerpiece for 45-holes of championship golf. The three unique courses designed by Robert Trent Jones, II and Greg Norman, including the challenging 9-hole Sharkbite Course, are managed by Troon Golf. The Leisure World® of Virginia offers prestigious home ownership in a perfect Loudoun County location, in the Lansdowne Conservancy, with views of the Potomac River and the Lansdowne Resort Golf Course. Leisure World consists of Condominium Homes in Lansdowne’s Premier Community with Resort-Style Living; Age Qualified and Access Protected. The focal point of Leisure World is its Clubhouse complete with auditorium/ballroom, exercise facilities and equipment, saunas, indoor swimming pool, hot tub, massage room, rooftop tennis courts, library, computer center, chapel, a billiard room, a Wii game console, Table tennis, Lifestyles Hair Salon, a PNC Bank branch, and its own gourmet restaurant, La Pergola. The clubhouse also has an art studio, pottery studio with its own kiln, woodworking shop, and several dedicated meeting rooms – hosting clubs, activities, lectures, instruction, and special events. There are three principal residential homeowners’ associations in Lansdowne. The largest is the Lansdowne on the Potomac HOA, which represents over 2,155 homes in the Lansdowne area, adjoining with the Potomac Station community to the west along Riverside Parkway. The second is Leisure World of Virginia, an HOA consisting of five condominium associations totaling over 1100 age-restricted homes. The third is the Lansdowne Village Green (Lansdowne Town Center), which represents over 500 homes surrounding the Lansdowne Town Center area between Riverside Parkway on the north, Route 7 on the south, Belmont Ridge Road on the west and the Lansdowne Country Club Golf Course on the east. The National Conference Center (NCC) is a corporate training facility in Lansdowne, Virginia. It hosts over 14,000 individuals per month and comprises 265,000 square feet of meeting space, one of the largest in the region. The center contains 250 conference rooms, an athletic facility, and 917 guest rooms. Lansdowne is the home of the Inova Loudoun Hospital. Inova Loudoun Hospital is a 183-bed nationally recognized, acute-care community hospital with a rich history since 1912. Lansdowne is located in Loudoun County. Since 2008 the county has been ranked first in the United States in median household income among jurisdictions with a population of 65,000 or more. Loudoun County’s population is the fastest growing of all counties in the United States. Lansdowne Town Center, located in Lansdowne, (Loudoun County), Virginia, is a mixed-use “life style” shopping center consisting of 150,000 square feet of retail and 40,000 square feet of office in the central core of the Town Center. This new urbanism development is strategically located at the intersection of Belmont Ridge Road and Route 7, adjacent to major arteries of travel and is bordered by the busy Route 7 corridor. The surrounding area includes mixed-residential units, over 3 million square feet of office, research institutions, hotels, conference centers, regional hospitals, 2 championship golf courses and Leisure World of Virginia. Students in Lansdowne attend schools that are part of Loudoun County Public Schools, which are consistently ranked among the finest in the nation. All of Loudoun County’s eligible high schools are included the best 1,000 high schools in America as rated by Newsweek’s Challenge Index. Children who live in the Lansdowne on the Potomac community attend elementary school at Seldens Landing Elementary School which is located in Lansdowne. Children who live in the Lansdowne Village Green (Lansdowne Town Center) community attend elementary school at Belmont Station Elementary School, which is located in Ashburn. Middle school students attend Belmont Ridge Middle School which is located in Lansdowne. High school students attend Tuscarora High School in Leesburg, Virginia. 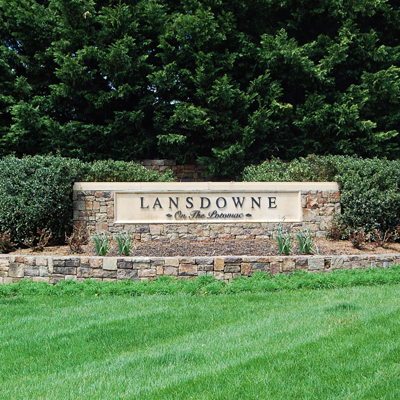 Lansdowne is ideally situated close to the Dulles Tech Corridor, along Route 7 between Leesburg and Ashburn. Commuters are just ten minutes from Sterling, a growing hi-tech business hub in the metropolitan area, minutes from historic and scenic Leesburg, the County seat, and just seventeen minutes from Reston, another location for working professionals and businesses. Developed in the late 90’s on former plantation land rich in history. On the property of Lansdowne on the Potomac, adjacent to what is now the Potomac Club house, sit two recently renovated buildings, a smaller smoke house and a larger, full detached kitchen that were once part of the Coton Plantation, run in the 1800’s by Thomas Ludwell Lee, Jr., a member of the illustrious Lee family for whom Leesburg was named. The Coton Plantation was an active plantation through that time and you can still see part of Mary’s Mill when hiking along nearby Goose Creek Trail. The silo from the plantation’s barn is now part of the Club house, adding history and character to the site. Office: 1.703.375.8427 | Branch: 1.703.724.9494, Licensed in VA.